- CV - a direct current (DC) signal used to control stuff. - all cabling and signals in eurorack are mono - if you want stereo you need multiples of each module or dual modules designed for stereo! - VCAs need a CV to allow sound to pass through. unless there's an offset/initial control set to allow some audio through. In a most basic patch this CV is generally a gate triggered envelope. - Envelope Generators need to be triggered. This is generally done via a Gate signal, but can be a CV from pretty much anything providing enough voltage. - Filters can completely silence a sound. since on a basic level filters remove frequencies from an audio signal, at certain settings a low pass filter may, for example, take all the high frequencies out of an audio signal that is just treble so nothing remains. - Some filters can self-oscillate. Effectively, when certain settigns are cranked up high enough the filter can emit a sound even with no input, generally a relatively loud audio frequency sinewave. - VCAs and Filters can distort when fed a sufficiently loud audio signal. this can be a very god thing - i love to feed the ASys RS-100 LPF and/or RS-180 VCA a really hot signal by putting a cranked up VCA or Filter with lots of Resonance before them in the signal path because they overdrive in a lovely soft, warm fuzzy way. - Most Sample & Hold modules require an external input to sample, AND output a DC CV signal. at sufficiently high sample rate settings the CV output can be used as an audio source, but generally the output will be either a stepped sequence of CV signals if the sample is a wave or some random/pseudo-random CV singals if the input is noise or a very complex audio source. - To split a cv that is to control the Pitch of multiple VCOs you will need a Buffered Multiple. if you use passive multiples or stackcables, too many modules drawing from the same pitch source will affect the voltage causing tuning to be off. you can get away with only a few splits with a passive multiple/stackable, sometimes. - Buffered Multiples have designated ins/outs - these wont work like a passive multiple. you can't get a signal out of an 'in' or put an in into an 'out' with a Buffered Multiple. - Some modules can be very sensitive to tiny changes in CV or settings, others can require quite big changes to get any significant difference in output. CVs and Audio signals can sometimes need attenuation or amplification as a result, and sometimes a DC offset can be necessary to allow CV's/Audio signals to be used interchangeably. some modules have controls such as 'Gain', 'CV' amount and 'Offset' built in. otherwise, a dedicated Attenuator, a VCA or an Offset module may prove a valuable, if not essential component of a system. - Cheaper Ring Modulators tend to be AC-coupled. this means they dont work on CVs. for this you need a DC-coupled Ring Mod. - something i have just been alerted to: on doepfers homepage where the standards are laid out theres no mention of pitch cvs. generally pitch cvs are between 0 and +10V, but not all vcos can respond to/accurately track the full 10V range. this is why most quantisers dont accept -ve cv values! You will require an analogue sequencer/Cv keyboard/computer/midi source plus midi -> CV device to produce 1v/Oct note CVs, Gate signals and so on, unless you want to use LFO's and other modules. This patch will give a standard monophonic note follows note at given pitch, with given length, synth patch. To test other modules most effectively, try patching their cv outs to the Filter cutoff or the EG Decay time for example. p.s. You're using a modular - rules are meant to be broken; with the exception of manufacturer warnings about specific module settings, inputs and outputs that dont like being used in certain ways, experiment! the whole point of a modular is to mess about and find unusual ways to trigger an envelope or shape a filter cut-off etc. Envelope Generators need to be triggered. True, but not all of them - Maths, Envelator, A-143-1 etc etc can be cycling, which makes them LFOÃ‚Â´s / oscillators. ...which makes most of them excellent oscillators as well. BTW, great thread and idea! Great idea, maybe a good addition to the Start your own Modular sticky in the general discussion forum? Since this is for noobs, we should be more specific: this also requires an Envelope being triggered via something to open said VCA. Below is a visual of a typical East Coast, single VCO mono patch. Is the difference between an attenuator (passive) and a VCA (active) is that one boost a signal and the other cuts a signal? Also, the "passive" part of "passive attenuator" means that it requires no power. When a friend first got the modular itch I sent him the following as an intro. Somewhat tailored for his preferences, of course. Google Ã¢â‚¬Å“basic sound synthesisÃ¢â‚¬Â and read some articles to get a sense of basic building blocks of synthesizers. YouÃ¢â‚¬â„¢ve already played around some so youÃ¢â‚¬â„¢ve got an idea, but getting a more specific picture and learning more about the terminology is a good idea before you start researching specific modules. www.analoguehaven.com is the toy store of choice. (You may need to click on the Ã¢â‚¬Å“EuroÃ¢â‚¬Â button at the top to get to the Euro section. Click on the down arrow by Ã¢â‚¬Å“EuroÃ¢â‚¬Â at the top of the screen and download the whole zip). This will let you play modular tetris as you think about which modules you want to buy and how theyÃ¢â‚¬â„¢ll fit together. Cases are measured by height (3U per row) and width (the standard width is 84 HP, 1 HP being the width between two mounting screw taps). Most modules come in even HP widths: 4, 8 and 10 are common. A few modules come in odd widths, which is a pain. Basic cases come in two flavors: 6U (2 rows) and 9U (3 rows). If you plan to stick to a small system, 6U is fine. I started with 9U because I knew that I'd get obsessed with this stuff. 9U is the cheapest option per HP, which is the unit used to measure the width of modules. The standard 3U row is 84 HP in width. The cases I have are all from Doepfer. Other case manufacturers are Modular World (a Chinese outfit with some quality control issues, but least expensive) and Monorocket (very nice cases, but availability is an issue). You can also buy rails and power supplies separately and build your own case. TipTop Audio offers a complete 3U solution called the Ã¢â‚¬Å“happy ending kitÃ¢â‚¬Â as well as separate rails and PSUs. Flight of Harmony also offers a power supply. The Doepfer A-100-LC6, the Ã¢â‚¬Å“Low Cost 6UÃ¢â‚¬Â wooden case, is probably your best starting point. It has a robust power supply and is well made. There are a lot of synth builders. I recommend focusing on a handful of them for your initial system. Malekko is located in Portland, Oregon. TheyÃ¢â‚¬â„¢ve got a partnership with an old school modular guru named Grant Richter who is behind the Wiard Synthesizer company. Malekko/Wiard modules are among the best in Euro, and as a bonus, theyÃ¢â‚¬â„¢re not too expensive for what you get. A nice bonus is you can order directly from Malekko to save tax and shipping costs. MFB is another German Ã¢â‚¬Å“budgetÃ¢â‚¬Â module builder. They offer a nice dual oscillator and a nice dual LFO that are good basic modules for small systems. Worth considering because they are inexpensive and sound pretty good, although I ended up selling on the dual VCO for something with a bit more I/O. MFB stuff is cheap feeling and cuts corners, but for basic utility itÃ¢â‚¬â„¢s not bad. Make Noise is behind the MATHS and a bunch of other awesome stuff. Easily the hottest manufacturer out there. Intelligel offers ultra-dense small modules that pack a huge amount of power into a tiny space. TheyÃ¢â‚¬â„¢ve got a wide slate of incredible utility modules that are a bit expensive but powerful, Ã¢â‚¬Å“buy onceÃ¢â‚¬Â kind of modules. Bubblesound makes outstanding, dense stuff, including the uLFO, the module with the 30 minute cycle time. TipTop Audio is a high quality builder with some good stuff available at decent prices. His oscillator and filter are both high quality and not too expensive. Synthesis Technology aka MOTM is operated by another of the old school modular designers who has recently expanded from the 5U format to making Euro modules. The E350 oscillator is from them. Oscillators produce the basic waveform that gets sound going in your system. Although other modules can produce a waveform (such as resonant filters) a dedicated oscillator or two is an important basic component of a fun system. Oscillators are also referred to as VCOs (Ã¢â‚¬Å“Voltage Controlled OscillatorsÃ¢â‚¬Â), although some oscillators are actually DCO (Ã¢â‚¬Å“Digitally Controlled OscillatorsÃ¢â‚¬Â). In the old days, DCOs were ridiculed as have terrible sound quality compared to analog VCOs, but these days there are a number of DCOs that are really amazing. Oscillators that go into sub-audio range for use as modulation sources are LFOs (Ã¢â‚¬Å“Low Frequency OscillatorsÃ¢â‚¬Â). You can save space by getting VCOs that can be used as both audio and LFO sources. Ã‚Â· Number of simultaneous outputs and waveform types Ã¢â‚¬â€œ the more the merrier. o Frequency range Ã¢â‚¬â€œ usability in audio and sub-audio (LFO) ranges. Dopefer A-111: DoepferÃ¢â‚¬â„¢s oscillator options are often overlooked but their Ã¢â‚¬Å“High End VCO A-111Ã¢â‚¬Â has a great reputation for quality. IÃ¢â‚¬â„¢ve never used it but itÃ¢â‚¬â„¢s worth having on your radar. Malekko Oscillator and Anti-Oscillator: Two very different modules but both have excellent sound quality. The Anti-Oscillator incorporates a wavefolder into its design, which for practical purposes has an effect not dissimilar to a filter. Capable of very complex tones. The Oscillator (also referred to as the Ã¢â‚¬Å“UnkleÃ¢â‚¬Â) is a very powerful VCO with a lot of awesome features. Two worth noting are its ability to be used as an LFO (the Ã¢â‚¬Å“fine tuneÃ¢â‚¬Â knob pulls out and switches it into low frequency mode) and its phase control (essentially allowing it to produce very complex waveforms). Starting out with one of each of these isnÃ¢â‚¬â„¢t such a bad way to go. MFB OSC-02: A pair of oscillators in a single panel. Limited I/O, but a lot of people love the sound. Personally I found the lack of controllability limiting, but the cost is ridiculously low and it does sound nice. I think this is more of a Ã¢â‚¬Å“musicianÃ¢â‚¬â„¢s VCOÃ¢â‚¬Â than an experimental VCO like the Malekko stuff. TipTop Audio Z3000: A hugely popular VCO. IÃ¢â‚¬â„¢ve not used it but it sounds great and is quite economical. Livewire AFG: The Livewire AFG is huge by HP measure, but also an incredible module. Very, very popular for its depth of tonal shaping power. I found it was too big but I mention it because it might appeal to you. Beautiful module thatÃ¢â‚¬â„¢s exquisitely built. These come up used pretty often and are a bargain for what you get. Also can serve as a LFO. SynthTech E350 Morphing Terrarium. This is the wavetable oscillator that I would not be without. Hard to get used, hard to get new. Just plain hard to get. Also can serve as a LFO. Bubblesound uLFO: Excellent LFO that also goes well into audio range and sounds great. An excellent alternative to the Malekko modules. Tons of I/O. One of my favorite modules. Harvestman Hertz Donut: I mention this because itÃ¢â‚¬â„¢s badass. Harvestman is a digital wizard and his modules are expensive as hell, but this module is capable of some very unique stuff. A dual oscillator so youÃ¢â‚¬â„¢d only need this to be set in the oscillator department, though itÃ¢â‚¬â„¢s I/O is not as deep as some others and it canÃ¢â‚¬â„¢t go into LFO range. MFB Dual LFO: If you go with VCOs that donÃ¢â‚¬â„¢t go into low range, the MFB Dual LFO is a cheap and quality way to get a pair of LFOs into your system. Ã‚Â· Number of signal and modulation inputs. The more the merrier. Ã‚Â· Response curve (typically 12db or 24db). This affects the tone of the filter. Ã‚Â· Mode types: Typical filter modes are Low Pass, Band Pass, High Pass and Notch. Low Pass is the one I use heavily, but having a multi-mode filter is pretty useful. Some filters offer outputs for different modes at once. Ã‚Â· Tonal features: Highly subjective. Some filters can be overdriven in beautiful ways. Others respond more or less well to audio rate modulation at the V/Oct input. Search Muffs. Cwejman DMF-2: This is the green module that I talked about being too expensive for your initial foray. Gorgeous sounding with tons of I/O, but Cwejman is the ultra-premium brand in Euro and his prices are getting higher all the time. These occasionally come up used but get snatched up within hours of being offered. Malekko Borg and Boggie: Both of these filters have deep modulation options and sound great. Also not too expensive. They use vactrols (light-based parts) which have a unique, Ã¢â‚¬Å“roundÃ¢â‚¬Â tone. TipTop Audio Z2040: IÃ¢â‚¬â„¢ve not used this but it gets rave reviews. Nice small form factor. Topobrillo Triple Wavefolder: Hugely popular alternative to conventional filters that looks like a lot of fun. IÃ¢â‚¬â„¢ve not used one of these but lust after one. Suit and Tie Guy Wavefolder: Love this module and consider it one of the more musical modules in my system. Harvestman Polivoks VCF: I didnÃ¢â‚¬â„¢t like this one especially but a lot of people do. 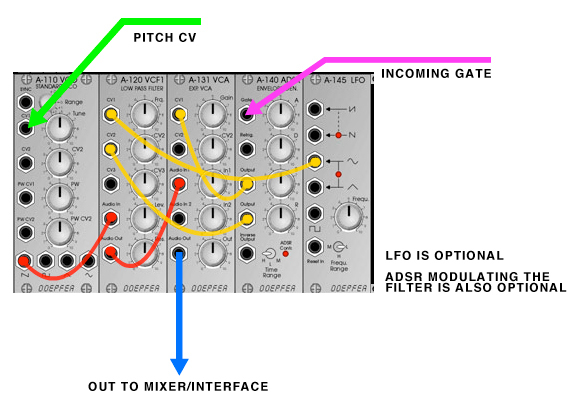 Doepfer, generally: Doepfer filters are generally considered to be underrated. IÃ¢â‚¬â„¢d love to try all of them some day. Envelopes are useful modulation sources. IÃ¢â‚¬â„¢d cut to the chase here and say that the MATHS or the Malekko Envelator are the things to consider. Personally I think the MATHS is too good to pass up. It can act as an audio source, LFO, trigger source, slew (smoothing) generator on signals, waveshaper (pseudo-filter), envelope follower, trigger delay, etc.etc.etc. A lot of modules donÃ¢â‚¬â„¢t have built-in attenuators to control the level of signals going into them, and I canÃ¢â‚¬â„¢t think of one that lets you attenuate output. Attenuators can be passive (unpowered) and these are very cheap to build (just a knob , two jacks and some wire). But powered attenuators are much better. VCAs (Ã¢â‚¬Å“Voltage Controlled AmplifierÃ¢â‚¬Â) are a core building block of any synth. VCAs come in a lot of stripes. I often use a filter as a VCA, but in a small system I think it's better to look at a normal VCA. What a VCA lets you do is not only control the level of a signal (i.e. acting as a volume knob) but also lets you control that volume level from an external source. The Doepfer A-132-3 Dual VCA is an outstanding module in terms of price and performance. IÃ¢â‚¬â„¢d just plan on getting one of these. There are lots of options for mixing signals. DoepferÃ¢â‚¬â„¢s mixers are cheap and good enough. Other options are the Suit and Tie Guy .MIX (a bit more expensive but better sounding, IMO). A mixer is a good Ã¢â‚¬Å“output stageÃ¢â‚¬Â option since it lets you control levels before you hit your audio interface with a hot signal. The Malekko Output module provides some quasi-stereo capability. I buy almost all my cables from Ad Infinitum. Good quality, great service. TipTop Audio makes Ã¢â‚¬Å“stack cablesÃ¢â‚¬Â which are expensive ($8 each) but handy to have a few, especially in a small system. They act as multiples, letting you patch one signal to multiple destinations. Actually VCAs usually do not add positive gain. They are more like Voltage Controlled Attenuators since they actually turn things down. Max CV into a VCA control input will set the amplifier to unity gain or 0dBv (no gain). 0v CV into the VCA will cause it to fully attenuate ie -80dBv. A VCA is Voltage Controlled. An Attenuator has no voltage control. That is the operational difference. note- some VCAs do provide some gain but this is rare as the traditional use of a VCA is to turn down a signal until control voltage is applied. great great great! this is an amazin tutorial. Big Thanks. suboptimal great info! very usefull to choose the right modules! Malekko is located in Washington state. just started my euro 3 months ago and cleared some stuff up for me i wasn't so about! Awesome thread! Thank you all for the information. This is exactly the kind of thread I was looking for. Thanks guys! this is great stuff for the beginner for the most part! i do wish it were in modular general as the vast majority of this stuff is not euro specific but c'est la vie. Thanks to everyone who has contributed to this thread! Even though I've had my modular for a few months, and have been using synths for almost 15 years, I learned a lot of good stuff here. if a module doesn't have CV control over something it doesn't necessarily mean it is uncool. just send a signal thru a VCA before this module to control it with cv- your amount of gain can be the CV control. Remember that you can modulate anything with anything you can modulate your oscillators but also a bunch of other stuff- VCAs, filters, wavefolders, VC-mixers, the list goes on.